I don't have many Terminators done yet. I do have them all built but only two painted so far. He took about 5 hours to do with all the coats of white to make it smooth and consistent. Here's a look at my Apothecary Terminator. I used the Chaos Autocannon with Assault Cannon barrels attached to the end. Looks close enough to the Imperial one. I had to file off the "Chaos" looking things to make in convincing. 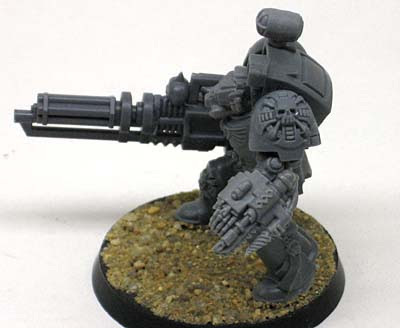 The Apothecary arm is mounted on a regular Terminator arm that was cut just below the elbow. Some filing and cutting away from each piece and they fit close enough. I'll see if I can get a pic of my recent Attack bike in the next couple days to post. Very nice! That will be one sweet looking squad when they're all finished. Nice, This looks to be the standard way to make the apothecary. I guess I am the only one crazy enough to try to build it out of scrap bits. I am still looking for a good lamp. I do not want to cut the one off the backpack but the vehicle ones are to big. Any ideas? erichrome: I too looked around for something suitable instead of using the "standard" lamp. More because I wasn't able to get ahold of the standard version at the time. I found almost everything else to be too big for Imperial use as well. Once i got ahold of the standard backpack though, I just resigned myself to using it. jlong05: Ironic isn't it?. He's going to help you get to one place or the other, no doubt about that. Can't wait to see them all finished up mate, but so far the paint job and modelling work is great! Looking good, Ron! After watching you painting the attack bike, I can appreciate the amount of work going into this. erichrome: For a lamp, have you considered the speaker from the Imperial Guard Vox backpack? For those asking about lamps, I recall there being a cool compact one on the newer Ork Trukk sprue that didn't look all that Orky. Might be worth looking into. This looks brilliant! 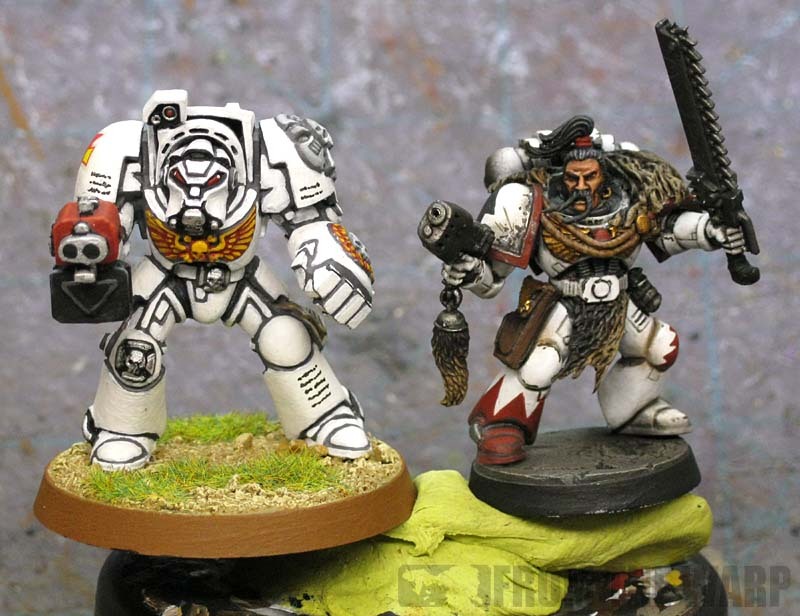 Looking forward to seeing more of it... and getting my raven guard started... completely opposite colour scheme this should be a great guide! Kevin: It's fun to paint at the store... even if I do get sidetracked easily and don't get much done. It's nice to get out sometimes and work with other people. That's a good idea for the lamp too. xNickBaranx: I never thought about Ork stuff, I just assumed it wouldn't work because it would be too "Orky." When I was looking, I just stuck with Imperial and Chaos bits. Peter: Now I wish I had picked something other than white. I know it'll look cool when I'm finally done but it's going to take me a while to get there. It's not hard, just real time consuming. Kevin: That is not a bad idea but I found something else that might work which I have on hand. The cities of death kits have a bunch of pieces with small lamp fronts on the them. Just need to get the back part and a mount set. cool stuff. always had trouble painting white due to my impatience. That is a super-clean paint job! Looks great! Maxstar: When it comes to white, the biggest thing is patience and staying with it. I'll tell you, after the first coat is on, I usually want to quit and the model looks horrendous. I look at it and wonder how I'm going to fix it but by the time I'm putting the four or fifth coat on... it looks perfectly smooth and consistent. 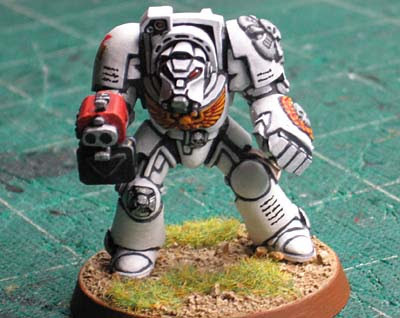 Man how do you get the white to look that good and even? Great stuff mate! Lots of patience (5 hours worth)and really thin layers of white paint.